Elizabeth Ann Seton is the first native-born American to be canonized by the Catholic Church. She founded the first free Catholic school in America. 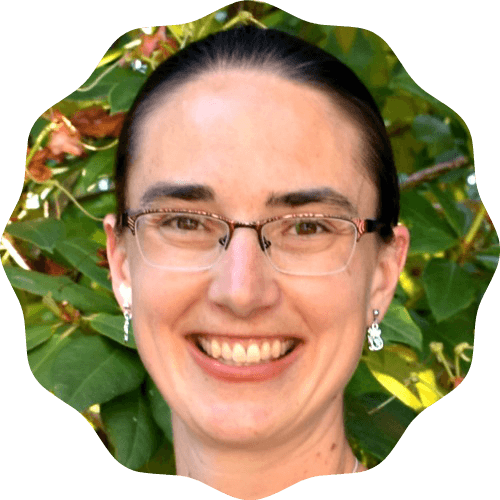 In homeschooling circles, her name is immortalized by the Seton curriculum. Across America, many Catholic schools are named for her as the Patron Saint of Catholic Schools. Like me, Elizabeth was a prolific reader. She was born on August 28, 1774 and had a simple, quiet childhood in New York, despite her high society background. Her parents were Anglican, although her mother died when she was only three. She had two sisters and several step-siblings (after her father remarried). At age twenty, she married the love of her life, William Seton. She and her sister-in-law Rebecca Seton became best friends. Together, they did missions of mercy around the city. When her father-in-law died in 1798, however, she and her husband assumed care for his seven younger siblings and the family business. Then Elizabeth lost her own father in 1801. William and Elizabeth faced financial difficulties and eventually filed for bankruptcy. In 1803, they sailed for Italy in an attempt to cure William’s tuberculosis. They traveled with only their eldest daughter, leaving four children in America with Rebecca. Unfortunately, William died just after Christmas that year. When Elizabeth found herself in a strange place, far from those she loved, she turned to God, just as I did when I was in Australia. In Italy, she discovered the Catholic Church. The Eucharist was a strong force in leading her to the Catholic Church, just as it was for me. She also found comfort in accepting the Virgin Mary as her own mother. She remained in Italy until 1804 because of her own poor health and then her daughter’s. Shortly after her return, her sister-in-law Rebecca died. Facing loss again, Elizabeth prayed, “If I am right, Thy grace impart still in the right to stay. If I am wrong, oh, teach my heart to find the better way.” In 1805, she joined the Church. Doing so alienated her from many Protestant relatives who would have helped her and her family during their time of need (her husband’s fortune was mostly depleted). Elizabeth for a time ran a boarding house for boys at a Protestant school. She was reunited with her sister-in-law Cecilia Seton, who became Catholic. Then Elizabeth’s boarding school failed. She contemplated entering a convent in Canada, where her teaching could support her daughters. Her sons were already supported in school by the Filicchis, her friends from Italy who had influenced her conversion. Instead, with the support of a priest in Baltimore, she opened a school there. She also took on the life of a religious, with a costume fashioned after that of nuns in Italy. Elizabeth’s school was the first free Catholic school in America. She was joined by her sisters-in-law Cecilia and Harriet. 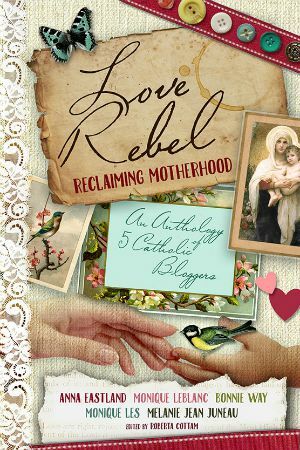 In 1809, she said her vows of poverty, chastity and obedience and became known as Mother Seton. Her Sisterhood was ratified in 1812, based upon the Rule St. Vincent de Paul wrote for his Daughters of Charity in France. In 1813, eighteen sisters made their vows with Mother Seton. Unfortunately, during the next few years, Elizabeth lost her daughters Anna and Rebecca. She also suffered from tuberculosis. In 1821, she died. Elizabeth Ann Seton was canonized on September 14 in 1975 by Pope Saint John Paul II. She was the first native-born citizen of the United States to be canonized by the Catholic Church. Her feast day is January 4. She is the patron saint of Catholic schools as well as widows, death of parents and children, and in-law problems. 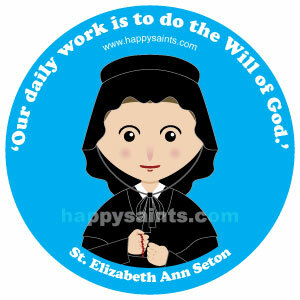 The image of Saint Elizabeth Ann Seton is used with permission from HappySaints. You can find colouring pages and crafts on Saint Elizabeth Ann Seton in the Happy Saints eBook 4. Kids will also enjoy listening to her story in the Holy Heroes Glory Stories Volume 14. 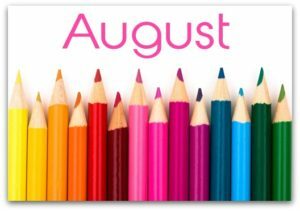 For more famous people born in August, like Elizabeth Ann Seton, check out Birthday Lessons in August. This post contains affiliate links; as an Amazon Associate, I earn from qualifying purchases. Every year on her feast day the folks at our parish have the opportunity to venerate a relic of St. Elizabeth. It is so edifying to ask her for her prayers in this manner! St. Elizabeth, pray for all of us!